Urbana Jr. High students take a breather from their research while visiting the Columbus Zoo. 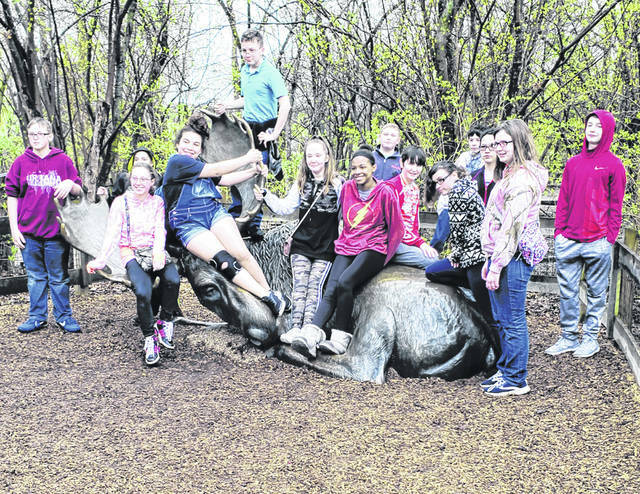 Fourteen Urbana Junior High students visited the Columbus Zoo thanks to a grant from the zoo and the students’ desire to continue research in their project-based learning unit. The students had created a project for National History Day based on this year’s theme of “Triumph and Tragedy.” They learned about the “tragedy” of older zoo habitats and their negative effect on animals. Then, they researched the “triumph” of the Columbus Zoo and how habitats became healthier and more engaging for animals under the guidance of Jack Hanna. Zoo employees sent students pictures and historical information about the zoo. The students then visited the zoo to do more research. They will revamp their projects to include more information and have their projects reviewed by zoo employees. They then will revise their projects again, share them with Columbus Zoo employees and display them in the lobby of the Urbana K-8 building..